Online E-Commerce app is best Startup idea on 2018-19 Year. If you are thinking about a business venture or a startup this year, an online grocery shopping app will be one of the best bets to go for. There are plenty of reasons why it can and it will succeed. You must have seen the famous Hollywood flick ‘The Groundhog Day’ and felt that it is true. All of us have experienced the same in our routine mundane lives. We wake up, get ready, go to work, toil all day long and only return home to begin this circle all over the next day. We do have some pleasure time after work but that is not always guaranteed. As we have to do many chores like weekly laundry, house cleaning and grocery shopping on top of these things, our pleasure time is not guaranteed. Just imagine, if one of these chores can be accomplished from the comfort of our couch using our smartphones. Would we prefer it? Of course, we most definitely would. That’s where the online grocery shopping app comes into the picture. It allows us to shop our grocery using such an app. We can order all of our grocery with only a few clicks, we pay online and a dedicated driver would deliver our grocery at our doorsteps. It will save a lot of time, money and energy on our side as a customer. That is the primary reason more and more people are ordering their grocery now online and big players like Instacart, Grofers, ShipIt, and FreshDirect have been investing and making millions of dollars out of it. The market of grocery is literally infinite. Nobody can live without eating so every living human being is a potential customer. It is bigger than all the sectors. So, anybody with the right ingredients is bound to succeed and online grocery shopping app is one of them. When the smartphone era began with the launch of the iPhone back in 2007, people weren’t buying much grocery online in the USA. Other retail segments were growing faster than the online grocery shopping segment. In 2009, the online grocery shopping segment generated just US$3 billion. It was about 2% of total grocery shopping. This segment generated more than US$10 billion by 2015. Surprisingly, by 2018, the online grocery shopping segment of USA crossed US$27 billion. Online grocery shopping took 7 years to triple the revenue from 2009 to 2015 but, it tripled itself again in just next three years. Experts expect that the online grocery shopping segment will cross US$55 billion by the end of 2021. It will cover more than 5% of total grocery shopping market. No one can miss such staggering growth. That is the reason pundits consider online grocery shopping app as one of the best ideas for startups and business in the USA and across the world. It is very convenient for consumers to search, shop and pay through an online grocery shopping app. They don’t have to lift the shopping all the way from the store to their homes. And, most of the time, online grocery shopping apps and sites run various offers and promotions for them. So, consumers save a lot of time, money and energy. It is equally convenient to vendors, store owners, merchants and drivers too. They can easily manage their inventory, orders, and business. They can also improve their brand loyalty by such a mobile app. If you are thinking of having an online grocery shopping app as the part of your business or startup, you have to have three apps and on web-based admin panel for the ease of your business. If all the mobile apps are complemented with web development, it will definitely improve the overall user experience and the business. Let’s have a look at the key features of all three mobile apps. They can be native iOS app, and native Android app or cross-platform mobile apps that will work on both the platforms. Push notifications, with e-mail and SMS backups. Equitysoft Technolsbs is an India-based full stack mobile app development company as well as web development company with a global footprint and truly global clientele. We have dedicated teams of experienced developers for iOS app development, Android app development, and web development. They have successfully completed more than 500 projects together. 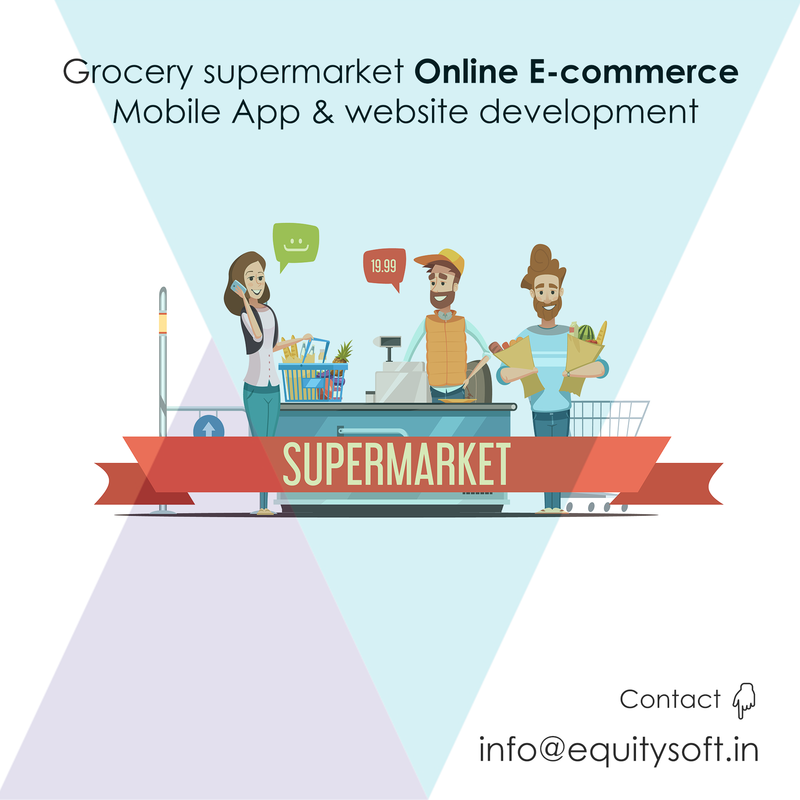 We have readymade solutions for online grocery shopping app and website. Its customization is a very quick job to suit your business and brand. Get in touch with our business team to know more. They will answer any queries you have, provide creative input and give you a quote to launch your startup in the direction of success!